Tucked off a private road in Malibu Valley against the backdrop of the Santa Monica Mountains lies the sprawling 55-acre estate. The heart of the property is a charming, French country farmhouse settled upon a rolling emerald landscape and nestled amongst eucalyptus, California Oak and Sycamore trees. A truly elegant and idyllic setting for the most unforgettable weddings. Triunfo is proud to be first and foremost a family-owned place, a legacy that carries over in the attention given to every client, the appreciation of even the smallest details, and the dedication to creating the most intimate events. The property is available for weddings, private or corporate event rental, filming, photography and charitable endeavors to support the local community. Triunfo Creek Vineyards is like no other venue in the Malibu Valley. It is the only location with acres of flat land amongst the hills. The large green lawn allows guests plenty of space for dancing, dining and to enjoyment of the grounds. The views of rolling vineyard juxtaposed with the natural Santa Monica Mountains makes for truly beautiful and unique photography. The Farmhouse at Triunfo has been remodeled to retain its original vintage charm while incorporating elements of luxury. Receptions are held both indoors and outdoors. Indoor receptions are held within the farmhouse and on the covered patio. Outdoor receptions are held amongst the large oak and sycamore trees on the large grass lawn. Both indoor and outdoor receptions have breathtaking vineyard views. Triunfo Creek can host 200 guests indoors and up to 1000 guests if opened up to the outdoors. Do you have space for doing a ceremony? Where do ceremonies usually take place? 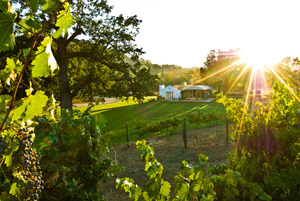 Ceremonies can take place anywhere on the property, however, most take place under a large California Oak tree with acres of vineyard in the background. What are your dinner prices for a sit-down and buffet? At this time we do not offer in-house catering. A preferred vendor list is provided for clients and they may choose to select a preferred vendor or choose a vendor elsewhere. Most of our caterers accommodate budgets between $75pp - $125pp. The venue rental cost is seasonal as well as guest count and day of week dependent. Am I required to use your food, beverages, and serving attendants? Yes, Triunfo Creek Vineyards does supply a mandatory vendor list filled quality vendors and unique vendors. We have found that using these vendors allows our brides and grooms to experience top quality food and perfect day of execution. Anything less on site would not do such a special day justice. What is your cake cutting fee? We do not charge a cake cutting fee. Outdoor music may be played until 10:30pm. Triunfo Creek Vineyards has 6 available outdoor parking lots which hold an estimated 600 cars. Valet service for a large amount of cars is required. Triunfo Creek does have a PA system. The music and PA system is included in the venue fee. We have relationships with nearby hotels. We are happy to put guests in contact with these hotels so that they may be offered discounted rates. Stunning. A summer wedding at Triunfo Creek Vineyards is special to be sure. Hidden back off a short private road and set back by the parking lot, the grounds open to a spectacular lawn, terraced vineyards over rolling hills, and a building that might've been airlifted straight over from the Amalfi Coast in Italy. The sound was perfect, whether outdoors at the foot of the vineyards for the wedding ceremony, or outside on the small patio for dancing, or on the lawn off the patio for the medium sized reception of 150 people. The bar across a beautiful courtyard artfully occupied us after the ceremony and before the reception. If the grounds and whole venue are certainly beautiful by day, it is as overwhelmingly romantic under the same stars as Sorrento or Capri at nightfall. - Jim Y.
I married the love of my life here at Triunfo Creek Vineyards. Our wedding was the most spectacular day ever! I never imagined I would have been fortunate enough to have a venue as beautiful as this one. The staff is kind, professional and super helpful. They really care and want your day to be perfect. Thank you to all of the staff for creating and protecting our most precious memory - our wedding. Much love and thanks to Eva & Jacqui!! - Anna K.
Triunfo is such a beautiful and intimate space. My now husband and I feel so lucky to have found it. Jacqui is also accommodating and generous, and a pleasure to work with! You should definitely book this venue! _ Chassica S.
Didn't drink there wine so could not tell you but as a wedding venue it was beautiful. Our friend had over a 100 people and with the large outside area, it felt intimate and tiny no matter how large it gets. The food was catered from outside and the alcohol and all amenities were from outside so just looking at it as a venue, it is gorgeous and easy to get to. - Steven K.
My husband and I were looking for the perfect venue for our intimate family wedding this past March. We found Triunfo via our wedding planner and we fell in love. Jacqui (the owner) reached out immediately and the ball got rolling rather quickly. There are no words to describe how beautiful and peaceful the venue is. The vendors they have are amazing and they are will work with you to accommodate your needs. We had an intimate wedding 40 people and the location was perfect. They are great for small and large. The grounds are stunning and the kids got to run around and play during cocktail hour... so did the adults. We could not imagine our day anywhere else. It was a dream wedding. Thanks Jacqui and team you guys were awesome. - Islamis V.
We had our wedding at Triunfo 2 weeks ago and it was AMAZING!! We could not have asked for a more perfect venue. Jacqui was our venue contact and she was the best. She was very flexible with our misc requests, patient with my thousand questions, and did everything she could do to make our wedding everything we wanted. The outdoor venue with surrounding vineyards was a gorgeous background for our photos, and our guests raved about what a great location it was. We had 130 guests, and Triunfo offered enough space for everyone, while still giving our wedding an intimate feel. Yes, the venue fee was higher than others we had checked out, but the built in dance floor, restrooms, and cute stand alone bar ended up saving us versus having to bring those in our own. (other places we considered had a lower venue rental fee, but did not provide any of those things- not to mention the unbeatable views and surroundings that other venues didn't have). Choosing Triunfo Creek as our wedding venue was the best decision we made! - Stacey H.